Is there any item of clothing more essential to a woman who works in an office than the black cardigan? I think not. Because despite the fact that we have mastered space travel, invented telephones that take pictures, and can treat many of the diseases that ravaged generations past, we remain slaves to the most intractable challenge of all: regulating temperatures in an office building. I've been on a utilitarian kick of late, trying to knit things that I will actually use rather than being sucked in by pretty pattern pictures or tempting Knit-Alongs. So when I received the 1,000 Sweaters book for Christmas, I started planning the ultimate in utilitarian knitting: the office cardigan in black. I spied a great deal on a bag full of Marks & Katten Bom Ull at the Wild & Woolly sale in January, and Alison and Colleen enabled me agreed that it would make a good cardi. I knew that the gauge would take a little time and concentration to get just right (the Bom Ull is a bit heavier than called for, and I am by nature a loose knitter), so I took my time. It didn't help that the book doesn't include schematics and only provides numbers for length and bust measurements (even for the sleeves!). 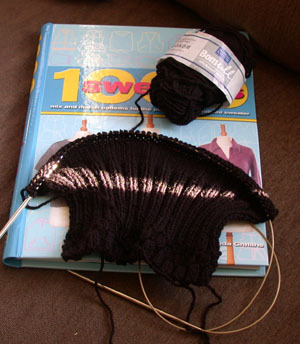 Oh, and gauge is only given in stockinette. After trying several different needle sizes, I decided to use 5s and knit down a size to correct for the discrepancy. I'm hoping the all-over rib will provide me with a little wiggle room if my calculations aren't just right!